You can’t post photos to Instagram without Wi-Fi. Blogging about your travels and uploading photos to social media is half the fun of taking a new adventure, which is why Indian Trails provides free Wi-Fi on all buses. 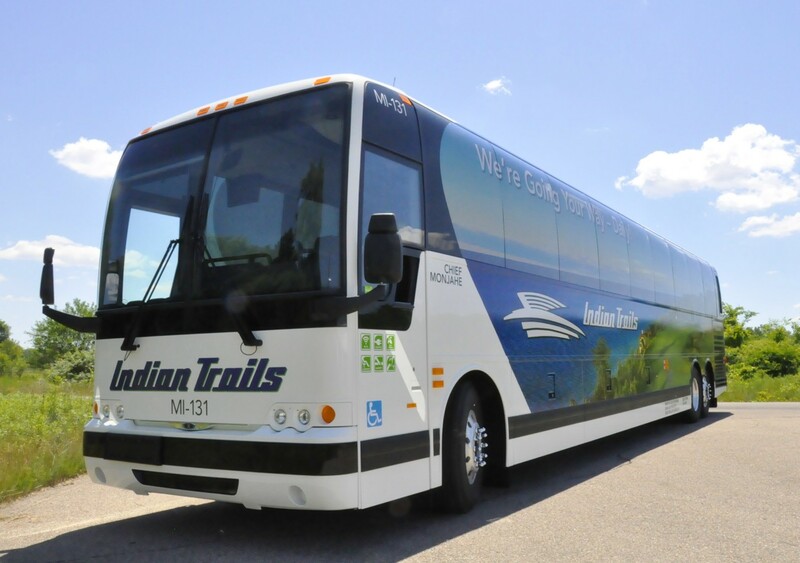 Don’t forget to tag us on Twitter (@indiantrailsbus) and Facebook (@IndianTrailsInc) when you post cool photos from your trip! The ability to stay plugged in shouldn’t be a premium service. 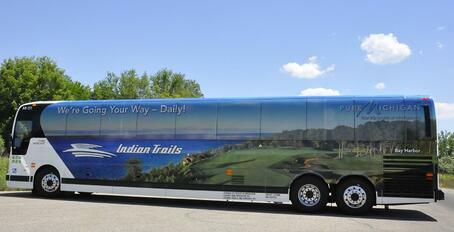 You never have to worry about that when you travel with Indian Trails. Each seat is accompanied by two 110V outlets. Additionally, our modern buses feature a wireless public address system, DVD players with color monitors, and individual overhead light and climate controls. Need to get a quick nap in on the way to your destination? Every charter bus has comfortable, ergonomic reclining seats with adjustable footrests, and tinted windows, giving you the ability to relax, and leave the transportation up to us. There’s always enough legroom and space to spread out. There’s even a cup holder for each passenger and plenty of space overhead and below the bus to store luggage. You won’t have to worry about flipping a coin for the middle seat, either. 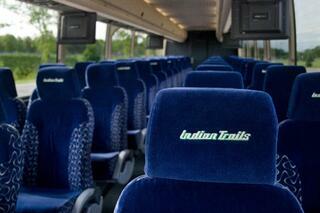 Everyone gets a window or isle seat on an Indian Trails bus. We make sure every charter bus is fully-equipped and sanitized before each new trip. All of our 52- and 56-passenger coaches are equipped with clean, well-supplied restrooms. Our full-time certified mechanics keep our buses safe, sound, and running like new. 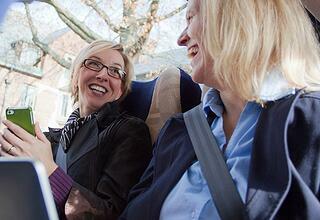 Every motor coach undergoes a thorough equipment check before each new trip. To top it off, Indian Trails drivers have had some of the best training in the nation and are guaranteed to be helpful, courteous and professional. We added five new eco-friendly motor coaches to our fleet in 2016, featuring technology that exceeds EPA standards by reducing exhaust pollutants while achieving high fuel economy. These buses include an electronic stability system that enables drivers to avoid danger on slippery roads. Additionally, we rolled out 10 new “Pure Michigan” buses last year that come equipped with technology that achieves a fuel economy of 240 passenger miles per gallon. All of these charter buses have an ADA-compliant wheelchair lift, three-point retractable seatbelts for passengers, and a front-kneeling suspension to assists with loading and unloading. Whether you’re traveling for business or pleasure, you’ll want the same thing — a bus that’s fresh, clean, right on time, and ready to roll. When you’re ready to book your next trip, call on us.